ClearView Extreme and Shuttle systems now provide four programmable 12G-SDI interfaces which create new capabilities for 8K and 4K picture quality analysis. New 8K systems support play or record operation up to 60 frames per second and all new models provide dual channel 4K recording, simultaneous 4K output/record function, and 4K dual output playback. A new HDMI 2.0 output applies full UHD 10 bit 4:2:2 HDR formats up to 60p frame rates with HDR color transform signaling to HDMI monitors. 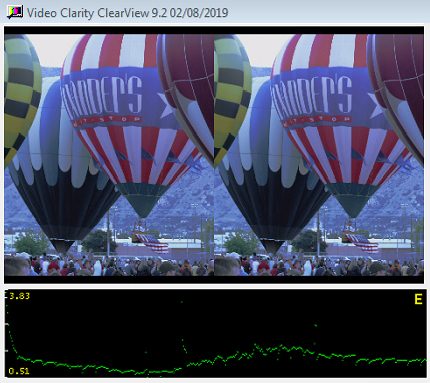 Available at NAB and provided in the upcoming new ClearView version 9.2 is ΔEITP. Following ITU Recommendation BT.2124, ΔEITP is useful to assess the potential visibility of color differences in HDR television images and signals. Applications include camera output characterization and objective assessment of differences introduced by signal processing techniques. Making its NAB debut in ClearView is the latest VMAF perceptual quality measurement. This new metric designed by Netflix is now available in ClearView 9.1 systems and software. VMAF accurately measures human perception of video quality, is consistent across content types whether for natural videos or animated content, and works well in assessing picture artifacts relevant to adaptive streaming such as compression or scaling artifacts. Product manufacturers and research organizations require new systems to assess picture performance with reliable, uncompressed video playback of as many resolutions and frame rates as possible. The new ClearView Player 8K system with Venue Player meets the growing need to reach the highest resolutions in a reliable lab environment recorder-player providing the latest 12G-SDI interfaces with an option for a Display Port output providing 4K playback up to 120 frames per second. The RTM real-time full-reference quality testers now provide two channels per system in all HD and 10G IP product models. An important application of these systems is for testing new statistical multiplexing technologies, especially when new channel sharing or bandwidth sharing agreements are in place, where providing two or more channels as a permanent test of quality is preferred over applying fixed bit rate allocations for program service level agreements. Another solution coming to Video Clarity’s NAB 2019 is a compact, multiple-input video recorder designed to support up to eight full HD inputs or two UHD inputs. Each input applies up to sixteen channels of embedded audio and provides hours of uncompressed video recording in a single rack unit package. The new Venue Recorder models contain multiple storage options and individually removable SSD drives for physical drive archive and replacement purposes. Applications include program compliance recording and multi-camera test environments where two UHD or more than four HD cameras need to be synchronously recorded as uncompressed video with an easy to use system interface.